What could be better than a 50p equestrian coin for only £2.99, plus postage and packaging? It’s a steal if you’re collecting the 29 50p coins that have been produced by Britain’s Royal Mint to mark the London Olympics. 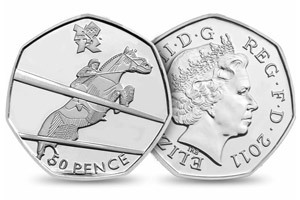 The coin depicting equestrian events was designed by Thomas Babbage. In January 2009, the Royal Mint launched its biggest ever competition, inviting the British public to design the new 50p coins. Thousands of designs were received from all over Britain, featuring all 29 sports of the 2012 Olympic and Paralympic Games. The best designs were selected and have been made into collectible coins. Babbage was living in Austria when he heard of the competition through keeping up-to-speed with British news by visiting news websites. He has a degree in art, focused on painting, but chose to take a different career path and is currently pursuing teaching. He travelled to Austria, Germany and Spain to teach English.